Marking another milestone in the country’s deterrence capability, India on Saturday successfully carried out the maiden canister-based trial of its most potent missile Agni-V, which has a strike range of over 5,000 kilometre and can carry a nuclear warhead of over one tonne. The new delivery mechanism gives the armed forces increased operational flexibility. "Successful test-firing of Agni V from a canister makes the missile a prized asset for our forces," Prime Minister Narendra Modi said on Twitter after the test on an island off the eastern state of Orissa. 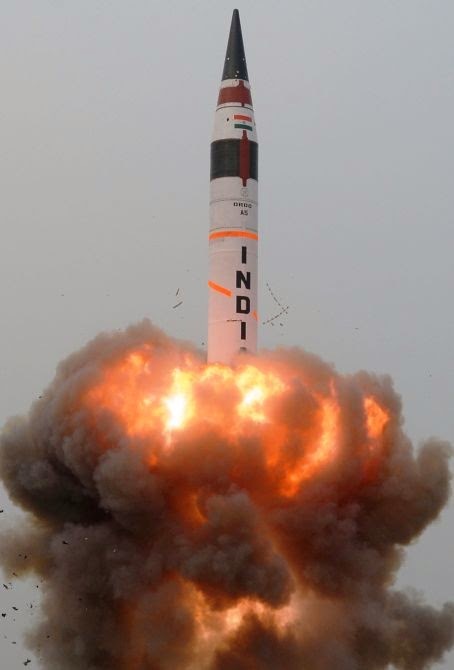 The Agni V—developed by India's Defence Research and Development Organisation—was first tested in April 2012. Analysts say the Agni V has the range to strike any target on the Chinese mainland, including military installations in the far northeast. India sees the rocket, which has a range of 5,000 kilometres (3,100 miles), as a key boost to its regional power aspirations and one that narrows—albeit slightly—the huge gap with China's missile systems. Agni, meaning "fire" in Sanskrit, is the name given to a series of rockets India developed as part of a guided missile development project launched in 1983. India and China, each with a population of more than one billion, have prickly relations and a legacy of mistrust that stems from a brief but bloody border war in 1962. India, the world's biggest arms importer, is in the midst of a $100-billion defence upgrade programme. The new right-wing government has cleared long-delayed projects worth over $16 billion since storming to power at elections in May. Modi has pushed for greater indigenisation of its defence industry, saying India must build up its military might to the point that no other country "dare cast an evil eye" on the South Asian nation.